TheHarley Davidson sells more touring motorcycles then any other manufacturer and the Ultra Limited is the flag ship of the touring line. For 2014 Harley Davidson re-worked their touring line with upgrades to the 103 ci V-Twin engine, the suspension, brakes and the batwing fairing. In the case of the Ultra Limited, the engine has a water cooling system that cools the area around the exhaust manifold. By doing this the compression ratio was increased which increases the torque by 10%. Harley Davidson also added a new stereo / info center and easier to use saddlebag lids. The reincarnation of the Voyager occurred in 2010 and has changed very little in the past 4 years. The Voyager is powered by a 1700 cc water cooled V-Twin and was styled to have the appearance of a 1960's roadster, including the gauges that are large, analog and very "car" like. I had the opportunity to ride both motorcycles on the same day so it was easy to compare the two. I'll get the price comparison out of the way first as there is a huge difference. In Canadian dollars, the Harley Davidson comes in at a whopping $31,659 while the Kawasaki is a little over $10,000 less at $21,399. From my seat view, this is the only area that the Kawasaki wins. In the handling department, which is first on my priority list, the Harley Davidson wins. It's very nimble for a very large motorcycle and it took aggressive cornering on my part to make sparks fly with the floor boards. The Kawasaki, on the other hand, was less solid in it's handling and it took more effort to get the big bike turned. I was also shocked (at least the first time) when I touched the floor boards down with little effort and little lean angle. The poor guy riding behind me was also shocked. In the engine department the Harley also wins. The "tweak" that were made to the engine are noticeable compared to the 2013 model and I enjoyed the roll on torque, along with the sound and feel of the engine. The Kawasaki's engine was bland. 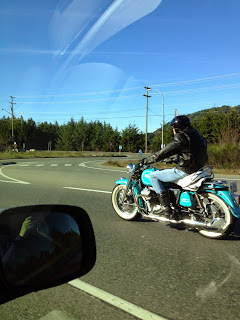 It got up to speed, however it felt sluggish and I found the engine feel and sound to be too refined for a V-Twin. In the rider comfort department, the Ultra Limited wins as I loved the feel of the seat, the position of the handle bars and the leg room. The Kawaski's seat pushed me into the tank, which was an uncomfortable feeling and I kept trying to push myself back. The seat would be the first change I'd have to make if I owned this bike. Passenger comfort is very important for large touring motorcycles and my wife found the Harley Davidson seat to be very comfortable, unfortunately the chrome "protection" bars at the front of the saddle bags pressed against the backs of her legs and she found that uncomfortable. For some reason Kawasaki Canada wouldn't allow me to take my wife along on the test (something that Harley Davidson encouraged). I've liked the looks of the Voyager since it "came back" in 2010 and I find frame mounted fairings to be better for riding long distance then the fork mounted batwing fairings, however when it comes to overall appearance the fit and finish of the Harley Davidson is much better then the Kawasaki, which has a "plastic" appearance. For this comparison, the Harley Davidson is my clear choice for a winner, however I would have a difficult time justifying the cost, especially since my wife found the overall comfort of the Harley Davidson uncomfortable. 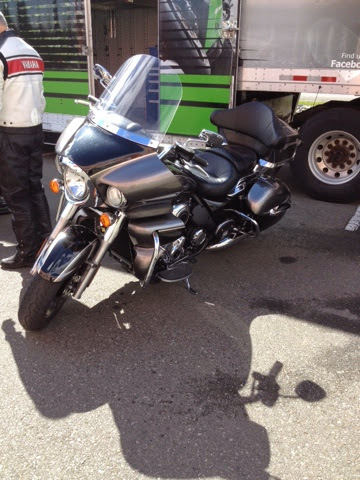 The Voyager is a great budget touring motorcycle, however $21,399 is still a lot to pay for such a bland motorcycle. 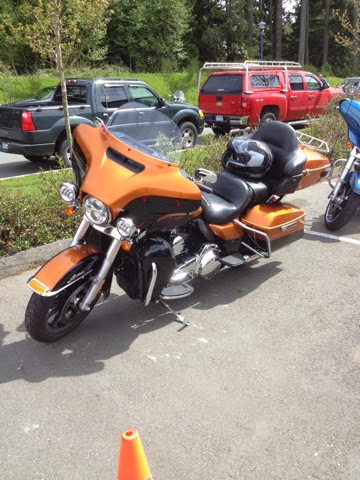 My wife and I will be spending a week with the 2014 Honda Gold Wing later this month so I'll report back on how this motorcycle stacks up against the Harley Davison and the Kawasaki.